I recently spent the day shopping in Downtown Auburn and when I turned into the downtown my eyes were met with buildings both old and new ; with shops that were filled with everything from boutique clothing to locally brewed beer. What's convenient about shopping in Downtown Auburn, is that the shops are close together making it easy to park and navigate. If you’re into cooking or just enjoy anything culinary then “The Olive Twist" should be the first place you visit. Inside this culinary boutique they have everything from specialty spices to first-pressed extra virgin olive oil to flavor fused balsamic vinegar from around the world. You can try their olive oils or balsamic vinegar from their tastings bar before you purchase. They also try to keep their inventory local by selling items such as honey from Waterloo, IN or Bubble Bath Beans from Albion, IN. Located in the building on 6th and Main is a cute little shop called “Hidden Key Boutique”. The shop opened up five months ago in a space formerly occupied by a shop called Peeker’s. The owner decided to keep the Peeker’s merchandise which is comprised of specialty kitchen gear and the famous Melissa & Doug Toys. They also sell women’s clothing items such as boutique tops and athleisure wear. 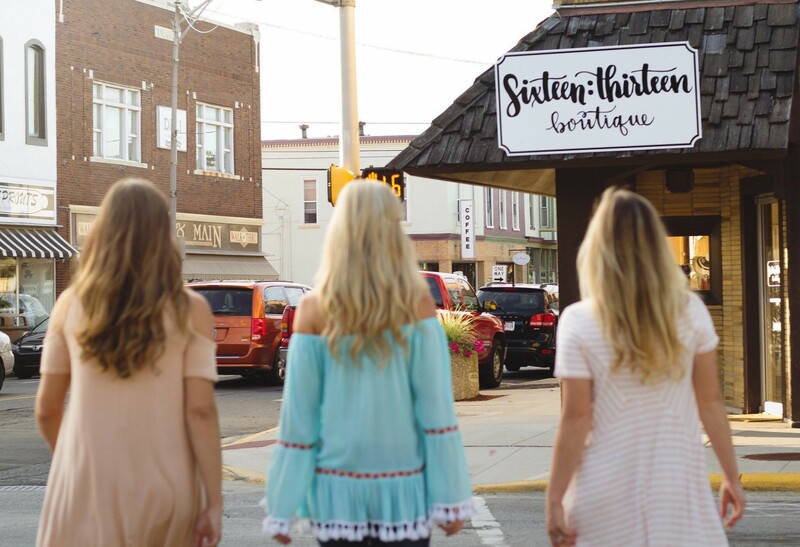 Cross the street again and you see another boutique called “Sixteen: Thirteen Boutique” located at 102 N. Main St. Here there is another fabulous collection of women’s clothing and accessories. They have wide selection of purses, tops, dresses, hats and much more. On the same street you can stop at Mad Anthony’s Auburn Tap Room to grab a bite to eat for lunch. I had their famous Greek Unwrap and my friend had the Asparagus Salad with Balsamic. Or can grab a mid-day brew from their selection of locally brewed beer. You would definitely need more than one day to explore all the shops and restaurants in Downtown Auburn to get the full experience. It’s amazing what hidden gems are located in a small town; all you need to do is explore and see for yourself. For a list of the other shops in Downtown Auburn, visit our website.